In my discussion of Di Vincenzo et al. (2012) and Freidline et al. (2012), I noted how Neandertals appeared to be converging towards a modern human form; this seemed to occur both with respect to the ancestral forms usually assigned to the taxon H. heidelbergensis, but also with respect to earlier Neandertals. Some of the most "modern-looking" Neandertals are late specimens such as Vindija (the main source of the Neandertal genome), and these often appear more similar to modern humans than many earlier (pre-100ka) specimens. A book chapter by Milford Wolpoff and Sang-Hee Lee ("The African origin of recent humanity" in African Genesis: Perspectives on Hominin Evolution (2012), eds. Sally C. Reynolds and AndrewGallagher) explores a similar topic. The following figure illustrates a model in which recent African Homo, represented by Herto, the hypodigm of H. sapiens idaltu, and Neandertals represent separately evolving lineages whose precursors are the Broken Hill cranium (Kabwe) and Petralona, a pre-Neandertal European hominin from Greece. Kabwe is much more primitive than Herto. A recent paper lists it simply as greater than 125ka, and Chris Stringer has cast doubt about its great antiquity. Tim White, on the other hand, considered it a precursor of the Herto skull, which he considered the first evidence of anatomically modern humans in Africa, still possessing archaic traits. This contention was, however, upset by the redating of the Omo remains from Ethiopia to ~195ka, making them much older than Herto. So, if Kabwe is near 125ka, it might even appear that the chronological sequence Omo-to-Herto-to-Kabwe is associated with increasing archaicity. So much for a model of H. sapiens gradually emerging in Africa out of more primitive forms; the recent publication of the Iwo Eleru skulls from Nigeria, and Ishango from the Congo are certainly not adding to our confidence that any such process of linear Ascent of Man in Africa ever took place. But, I'm digressing; if we can't really find a clear signal of a series of human forms in Africa leading to modern humans, perhaps we can find that Neandertals are becoming less and less like modern humans, as time passes since their last "common ancestor". The whole matter revolves around the issue of gene flow and selection. If Herto and Neandertals represent separately evolving lineages, then their distance from each other ought to be greater than the distance of either one to the more archaic specimen from the same region. 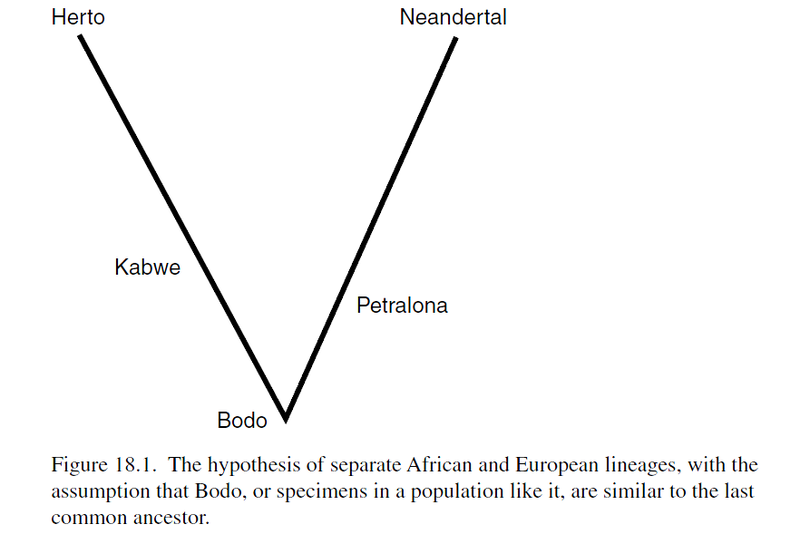 Herto ought to be closer to Petralona than to Neandertals if Neandertals continued to evolve as a separate lineage for 100-200 thousand years after Petralona lived (depending on the age of that specimen). But, this is not what is observed at all (right). 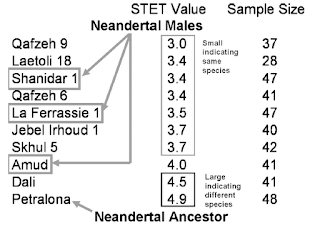 Herto appears closer to Neandertals Shanidar 1, La Ferassie 1, and Amud than to Petralona. Contrary to expectation, Neandertals are apparently converging with African groups of similar age, they are not diverging from them. 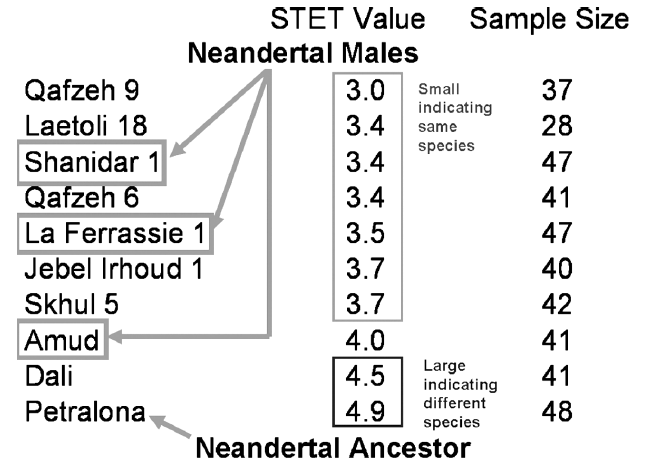 One could also observe, that lower differences occur between Herto and some Neandertals (e.g., with Shanidar 1) than between Herto and some anatomically modern humans (e.g., with Skhul 5, Qafzeh 6, and Jebel Irhoud 1). In fact, the ability of admixture to "converge" populations is the basis of the multi-regional evolution theory, although that is usually posited in terms of gene flow. But, the basic idea is still the same: our relatively uniform human species may not be entirely the result of tree-like divergence of populations from an original African population, but rather of a confluence of streams of ancestry derived from Lower and Middle Paleolithic populations of Homo. Geneticists have sequenced the genomes of two archaic hominins (Neandertals and Denisovans): both are differentially affiliated to regional groups modern humans: archaic humans can no longer be considered irrelevant twigs of the human family tree. Geneticists have identified segments of archaic DNA that have introgressed in certain African populations. It seems that archaic admixture is ubiquitous in the human species, even in its supposed cradle. There is other evidence besides: Mounier et al. (2011) noted that even within the group of modern skulls the most ancient examples were more archaic-looking. This would agree with the findings of Crevecoeur et al. (2009) that recent mankind possesses a subset of Late Pleistocene variation. It is also, indirectly supported by the findings of Reich et al. (2010), according to which, the genetic divergence of Neandertals and Denisovans (644ky), two contemporaneous populations living in a part of Eurasia exceed the total genetic divergence of all modern human populations (maximum: San-Papuan, 607ky). First, it introduces an arbitrary distinction: no one expects different regional human groups to have contributed equally, or even comparably to recent mankind: some populations (say Homo floresiensisis) may have been truly isolated and may have contributed nothing. Others may have inhabited lands with low carrying capacity (say dense, impenetrable tropical rainforest or the fringes of the glaciers), or may have acquired key innovations later than others. So, while the majority of modern human ancestry may stem from a restricted geographical region (in my opinion the Sahara-Arabia belt around 100 thousand years ago), other human groups (such as Neandertals, Denisovans, archaic Africans, etc.) are not irrelevant: they are our ancestors too. But remember, this is all relative to Africans, it doesn't tell you if Africans have a lot of Neandertal DNA or a little bit of Neandertal DNA: it's just that non-Africans are elevated one little bit up, a step higher than the Africans with respect to Neandertal sharing. In other words, it's not only x% Neandertal in Eurasians and 0% in Africans; it can also be 10+x% in Eurasians and 10% in Africans: we can only estimate relative levels of influence, not absolute ones. Absolute levels could only be estimated if we had the genomes of old Africans: we would then see modern Eurasians and Africans arrayed on the Old African-Neandertal line, the former a little closer to Neandertals than the latter. But it is far from clear that modern humans in Africa would have escaped Neandertal gene flow altogether. The Europeans are not evolving in a different direction, away from the rest of humanity. The European palaeo-deme , including Neandertals, evolved to be more similar to the descendents of Herto over time, not less similar. The convergence of African and European palaeo-demes demonstrates the presence of gene flow between them, and we agree with the description of these palaeo-demes as ‘varieties in a single metapopulation’ (Hawks and Cochran, 2006 ). 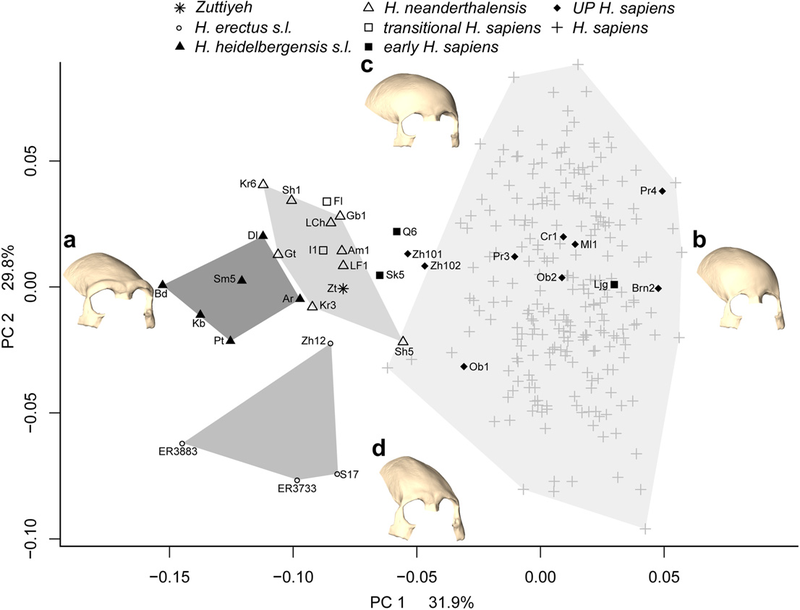 Moreover, later than the Neandertals, post-Neandertal anatomical variation in Europe includes Neandertal features, even features that evolved locally to be characteristic of most or all Neandertals and were rare or absent in other regions. I am strongly leaning towards acceptance of something quite akin to multiregionalism; it is almost certainly true in a sense: the evidence for widespread archaic admixture it irrefutable. On the other hand, there does seem to have been a Big Bang in human evolution, associated with mtDNA haplogroup L3, Y-haplogroup BT, and the reduced genetic diversity observed in Eurasians relative to Africans. But this appears to have been more akin to the success of a particular local population within a widespread species, rather than the emergence of an altogether new species. The greatest thing about this new paper is that it supports the multiregional hypothesis both anthropologically and genetically. "The convergence of African and European palaeo-demes demonstrates the presence of gene flow between them..."
It does not demonstrate this. Convergence, by definition, is parallel evolution, which is opposed to both admixture and common descent. Elephants and humans/big apes both have large brains not because there was gene flow between them. "the evidence for widespread archaic admixture it irrefutable." Neandertal and Denisoval alleles are found at highest frequencies among Amerindians and Papuans who occupy the areas with no attested archaic hominids. "Neandertal" admixture is not higher in Europeans or Southwest Asians who occupy the regions populated with Neandertals. In Africa, the molecular dates for the "archaic admixture" falls squarely into the time frame when only "anatomically modern humans" are attested in Africa. "I am strongly leaning towards acceptance of something quite akin to multiregionalism"
Then you're strongly leaning toward accepting an idea divorced from data. It is fairly dumb to claim that convergence represents parallel evolution without gene flow, when we know for sure that Neandertals are not a true outgroup with respect to modern humans (they're more related to Eurasians than to Africans). I've seen no evidence that Amerindians have more Neandertal admixture than other Eurasians. The statistical tests show otherwise. If you think they did, the data are there for you to prove it. "It is fairly dumb to claim that convergence represents parallel evolution without gene flow, when we know for sure that Neandertals are not a true outgroup with respect to modern humans (they're more related to Eurasians than to Africans)." You have a complete confusion reigning in your head. Convergence and parallel evolution are synonyms. Period. Admixture may create similarities between two populations, which are not due to convergence or common descent, but convergence is not caused by admixture. "I've seen no evidence that Amerindians have more Neandertal admixture than other Eurasians." This is because you haven't studied my website well enough. See, e.g., http://anthropogenesis.kinshipstudies.org/2012/03/american-indians-neanderthals-and-denisovans-pca-views/. Neandertal-confirmed B0006 is at highest frequencies in American Indians, Amerindians are next to Papuans and before East Asians in the frequencies of Denisovan alleles (Skoglund). "The statistical tests show otherwise." Statistical tests tend to exclude Amerindians from the sample. 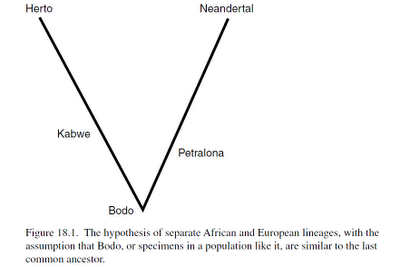 If you think that Amerindians are not particularly closer to Nenadertals and/or Denisovans, prove it. But try to get a good sample of populations. "If you think they did, the data are there for you to prove it." I let the ball roll away and go for a drink, because talking to you is very taxing. I have been convinced of it since I attended a lecture on the subject by Alan Thorne, an Australian follower of Wolpoff. It also fits the evolution of almost every other species, so why not humans? "Admixture may create similarities between two populations, which are not due to convergence or common descent, but convergence is not caused by admixture". We're far more likely to be dealing with admixture than with convergent evolution here. The various human 'species' were subject to different ecological conditions so would normally be expected to diverge, not converge. "Neandertal and Denisoval alleles are found at highest frequencies among Amerindians and Papuans who occupy the areas with no attested archaic hominids. 'Neandertal' admixture is not higher in Europeans or Southwest Asians who occupy the regions populated with Neandertals". Like Dienekes I'm not convinced that Amerindians have a high frequency of Neanderthal genes, but even if they do you are ignoring the fact that ancient humans probably moved round a lot more than they are usually given credit for. Populations arise and go extinct continuously. Dienekes, forgive the seemingly silly question, but when you say "converging" are you implying convergent evolution or using the word in its more common sense? "Neandertals converging with modern humans, not evolving separately"
The Neanderthal specimens from which the Neanderthal genome was derived are looking more and more like an unfortunate choice. If these Neanderthals were actually admixed with early pre-Eurasions on their way out of Africa, that would likely throw a huge statistical monkey wrench in the perceived amount of Neanderthal DNA in modern humans. What we're pointing to as Neanderthal DNA in us might just be those genes from the early Out-of_Africans that admixed into the specific Neanderthal population that was tested. Thus, we're actually seeing us in them, not the other way around--and we're giving the genes an incorrect Neanderthal label. "It would appear that aspects of modernity appeared throughout the Old World during the last few hundred thousand years. 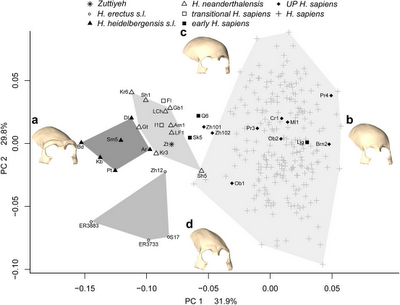 Perhaps (as the multi-regionalists would have it), this was facilitated by gene flow between distant human groups; alternatively, H. heidelbergensis already had the seeds of his future evolution, and similar solutions were found for similar selective pressures independently." I honestly don't understand what you mean. "We're far more likely to be dealing with admixture than with convergent evolution here. The various human 'species' were subject to different ecological conditions so would normally be expected to diverge, not converge." We don't know where they lived and how they moved - that's what we're trying to figure out. But you use your assumptions as replacements for answers. Dziebel, as usual, you are arriving at huge conclusions from the worldwide distribution of just a single marker. This is ridiculous. It's not just one locus. The whole genome is pulled toward Neandertals Amerindians first and toward Denisovans Papuans first, Amerindians next. Regarding B0006, it's pretty telling that although Neandertals and Europeans/Southwest Asians occupied the same region, it's Amerindians that have the basal clade at highest frequencies. With several other following suit. So, what we are having here is not archaic admixture but phylogenetic archaisms that non-Africans share with Neandertals and Denisovans with the exclusion of Africans. I was not talking about the SNP PCAs but about the B006 haplotype. As for the SNP PCAs, according to them Amerindians are not much different from Eurasians in their genetic distances to Neanderthals and Denisovans. Also do note that those PCAs show only the first two dimensions of genetic variation, so there are still some uncertainties. Do you have info about the Fst distances of Amerindians to the archaics? We can compare their Fst distances to the archaics with those of other modern human groups.
" If these Neanderthals were actually admixed with early pre-Eurasions on their way out of Africa, that would likely throw a huge statistical monkey wrench in the perceived amount of Neanderthal DNA in modern humans". Exactly. That (I presume) was what Dienekes was getting at when he wrote something like 10% + X% concerning the admixture level. Africans may have some level of Neanderthal genes, and from before any realistic OoA scenario. "Thus, we're actually seeing us in them, not the other way around--and we're giving the genes an incorrect Neanderthal label". Possibly true, but either way we have admixture which many believed impossible until recent research showed otherwise. "We don't know where they lived and how they moved - that's what we're trying to figure out". I agree. But I think we are safe in assuming they moved considerably. That is what enabled such widespread genetic mixing. "But you use your assumptions as replacements for answers". All scientific understanding involves assumptions. Those assumptions may eventually be proved true or untrue, but at the moment the assumption that human groups have always formed hybrids when they met, at least to some extent, is most likely correct. "It's not just one locus". And it is that fact that makes it unlikely we're dealing here with convergent evolution. Elephants and humans/big apes both have large brains because of convergent evolution. But that is the extent of their convergence. Modern humans and Neanderthals have far more in common than do elephants and chimps. "So, what we are having here is not archaic admixture but phylogenetic archaisms that non-Africans share with Neandertals and Denisovans with the exclusion of Africans". I think you are looking at it back to front. Africans have less because they are less admixed with the archaic Eurasians. Amerindians are Eurasians so they have more than Africans. If they have more than most Eurasians it is probably because Eurasians have become admixed with some other archaic Eurasian 'species', as yet undiscovered. Amerindians are Eurasians so they have more than Africans. If they have more than most Eurasians it is probably because Eurasians have become admixed with some other archaic Eurasian 'species', as yet undiscovered. 'and/or because of Eurasians' longer contact (whether directly or indirectly) with Africans compared to Amerindians, who were largely isolated from the rest of humanity for thousands of years after the submergence of the Bering land bridge"
"Do you have info about the Fst distances of Amerindians to the archaics? We can compare their Fst distances to the archaics with those of other modern human groups." What we do know if that South American Indians and Sub-Saharan Africans are the most divergent populations as measured by Fst. "I think you are looking at it back to front. Africans have less because they are less admixed with the archaic Eurasians. Amerindians are Eurasians so they have more than Africans. If they have more than most Eurasians it is probably because Eurasians have become admixed with some other archaic Eurasian 'species', as yet undiscovered." Archaic admixture was discovered in Africa (Tishkoff et al. 2012). It predates the split into Pygmies, Hadza and Sandawe. But it's not found outside of Africa (with the exception of just one locus), as it should've been if humans migrated out of Africa. "'and/or because of Eurasians' longer contact (whether directly or indirectly) with Africans compared to Amerindians, who were largely isolated from the rest of humanity for thousands of years after the submergence of the Bering land bridge"
That's exactly right. Just don't assume this separation was recent. Since South Americans and Africans are the most divergent, their split must be very old. 15,000 years ago is not recent. "15,000 years ago is not recent." It's recent by modern human standards. "and/or because of Eurasians' longer contact (whether directly or indirectly) with Africans compared to Amerindians, who were largely isolated from the rest of humanity for thousands of years after the submergence of the Bering land bridge"
I've thought about it again and realised that East Asians and Australians have probably been even more isolated from any regions subject to and further African influence than have Amerindians. Also the absence of 'Denisova' genes in the region between the Altai and SE Asia argues quite strongly in favour of an expansion of another 'species' in East Asia that separated the two regions. "What we do know if that South American Indians and Sub-Saharan Africans are the most divergent populations as measured by Fst." I though the most divergent populations were Australian Aborigines and Sub-Saharan Africans. "Archaic admixture was discovered in Africa (Tishkoff et al. 2012). It predates the split into Pygmies, Hadza and Sandawe. But it's not found outside of Africa"
That admixture is easily explained as the product of mixing after an OoA, possibly after a return to Africa by a subpopulation though. And the latest research shows archaic admixture is quite widespread, not just Africa. "It's recent by modern human standards". But it is beginning to become more and more obvious that humans have been a single, though very diverse, single species for two million years. It is not recent precisely by modern human standards, looking at the lots of genetic and anatomical changes and long-distance migrations in modern humans during the Holocene. It is clear from the FST results that Amerindians have been much more genetically isolated (whether directly or indirectly) from Africans than East Asians have. I don't get the notion that Africans could have substantially more neanderthal admixture. That's necessarily from the part of the genome that we don't know from the neanderthals, right? Or is it that there would be neanderthal genes that have the same amount of polymorphisms and whatever so that they don't look strikingly introgressed from a more divergent lineage? I find hard to grasp how "something akin to multiregionalism" could be true at the same time that present humans seems to be so genetically similar. Unless this "akin" is very "just any degree of admixture will do it". Or those versions which are like a "genetic replacement" from archaic polymorphisms by modern/probably African ones, with only a few being spared from the sweep. And even that would be not so much "multiregional" as apparently the low frequencies of seemingly neanderthal genes in Africa pretty much rule out a classic notion of widespread gene flow to all directions. It would have been extremely asymmetrical, a "genetic" out of Africa. Which I find harder to believe than just a more mundane introgression from neanderthals &/or whatever genetic structure resulting from past hybridizations, seems to require much more substitutions and intense selection, for no obvious reason. I'm not defending some strict version of OOA2 anyway. My own gut feeling would be a post-OOA2 multiregional evolution with early modern humans, preceded by an "heterogeneous multiregional evolution within Africa" to account for the initial moderns and their own divergence and perhaps archaic relics. After that it's just an uneducated gut feeling that even the neanderthal admixture, if really happened, could have been in fact through some sort of bridge formed by less derived rhodesiensis/heidelbergensis and early moderns/early modern continuity, rather than something more literal, full blown neanderthal and full blown modern sapiens. Perhaps this "model" could be summarized in "the least amount of hybridization of the closest branches that would cause the largest amount of mess". I'm also confused with this "convergence" of neanderthals. I could bet that the consensus was that the early neanderthals were more sapiens-like, not the late ones, which were the proper neanderthals. I guess the trick here may be the comparison with Eileru, but I think it may be argued that it's rhodesiensis not sapiens, so it's not really that sapiens and neanderthals were converging by significant gene flow or whatever, only that, as there were at least three "species", two of which were more similar to each other (or even converging or mixing). Possibly not even touching the third one, even though, as I've said before, perhaps there was a "bridge" of admixture anyway. It may end out being multiregional-ish but I still think this label is somewhat exaggerated for what I conceive as multiregional origins, which would be a bulk of local populations that don't decrease significatively in numbers, only gradually having genetic substitutions, replaced by genes from the neighbors and newcomers. Rather than the substitution and dying-off of populations with some admixture every now and then. Don't call me names if all I've said is BS, I don't claim it's sound, these are just the vague impressions of a barely informed person, could well be that it's all absurd according to actual knowledge. I'd really like to see very comprehensive and impartial/agnostic expositions of the full range of possibilities rather than confident defenses of a single specific possibility in particular.